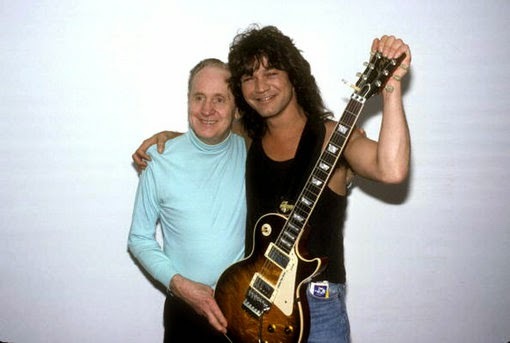 Many years ago my first guitar teacher loaned me a VHS recording of a concert tribute to Les Paul called "Les Paul & Friends." Among the highlights were Les Paul's demonstration of his "little black box," a sweet, subtle rendition of "Georgia" with Paul on lead and jazz guitar phenom Stanley Jordan on rhythm, and a blues cutting contest between David Gilmour of Pink Floyd and Jan Hammer of the Mahavishnu Orchestra. The high-energy peak of the show for me was the video below, featuring Eddie Van Halen—who was then the gold standard of rock guitar—with two highly esteemed musical collaborators. After giving the audience a taste of his vast sonic palette with the instrumental "Cathedral," Van Halen was joined by an all-star line-up for this instrumental version of "Hot for Teacher." On keys was Jan Hammer, a longstanding member of jazz fusion royalty. Tony Levin, a member of King Crimson with an astonishing catalog of side work, ably handled bass. The performance was novel on many levels. It was a rare opportunity to see Eddie Van Halen at the peak of his powers with world-class musicians whose chops were several notches above the average rock 'n' roller's. In his namesake band, Van Halen did the solos and emitted all of the fireworks, but here the virtuosic Jan Hammer held his own (and produced musical ecstasy faces to match). The Hammer-Van Halen point-counterpoint solos and climactic low-to-high, guitar-and-keys unison run before the closing main theme all point up the singular potency of jazz finesse married to the raw power of amplified rock.